Is your sales organization under pressure to generate more pipeline? Consequently, the onus extends beyond the marketing organization to warm up leads for the sales organization to sell to. Sales reps need to own the responsibility of doing their own hunting to fill their pipe and achieve their sales targets. While a variety of techniques exist in a salesperson’s toolkit, few are more effective, or more challenging to orchestrate, than an ABSD approach. 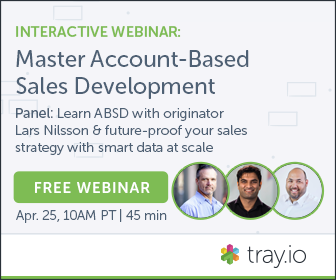 What is account-based sales development (ABSD)? Account-based sales development, or ABSD, is the strategy of focusing your outbound sales development efforts on individual strategic accounts and the target personas that lie within. This is a far more strategic, selective approach to the typical motion employed by many sales development reps (SDR): blasting out generic, repetitive email communiques to every single contact at every single company that has ever appeared in your database. By focusing your efforts at the account level, you can take a laser-focused approach with hyper-relevant messaging, thus concentrating interest in the same account and helps you drive critical mass towards deals more quickly and more consistently. But the account-based selling framework is equal parts art and science - a combination of smart best practices and the latest in sales technology. To learn more about this strategy, watch the interactive webinar featuring myself and senior sales leaders Karan Singh, director of sales operations consulting firm SalesSource, LLC, and J. Ryan Williams, Founder of SalesCollider. The mindset behind account-based sales development must be about identifying highly relevant prospects, within relevant accounts in your total addressable market (TAM), using relevant content and highly targeted messaging. Partnerships with key departments within your organization. The account-based selling model is fundamentally about collaboration. You need to foster a collegial, working relationship with your internal partners and be able to utilize their strengths to your advantage. It is important to illustrate to them how ABSD is going to amplify their efforts. Make them feel good about being an integral part of this process. - Outside Sales - Your account executives (AEs) eat, breathe, and sleep the details of the accounts they’re chasing. They’ll often have good intel to share with the SDR orchestrating ABSD campaigns. This strategic motion also builds a stronger AE/SDR bond, as the SDR often earns respect and becomes viewed as an invaluable asset to the AE. - Content Marketing/Brand/Demand Generation - Your marketing team creates the content assets and messaging you need to make outbound contact. Make sure you have full visibility into your company’s content library and a clear understanding of which types of content will be most appropriate for each account and target persona! - Subject Matter Experts - If your organization has the benefit of a “subject matter expert” group, individuals with deep insights into key verticals or topics, you’ll want to work with them to create a library of enticing solutions that are relevant to your target accounts and personas. - Partner Marketing - Through a combination of online research and discovery with your existing contacts within your account, you may identify one or more strategic partners already employed at the account. Check in with your partner marketing team to identify the latest compelling solutions you have developed with that partner. - Field Marketing - You may even be able to coordinate event-based opportunities (lunch-and-learns, specific trade show meetings, co-branded events). - A clear catalog of your company’s marketing content library, including ungated blog articles and gated offers such as eBooks and webinars. - A library of external industry articles, studies, and figures you can quote and link to in order to add immediate context to your conversations. Setting triggers - Using sales intelligence, social listening/selling tools, marketing platform alerts, and even search-based tools such as Google Alerts ensures you never miss a touchpoint with a strategic prospect. Monitoring buying signals - Monitoring B2B behavioral intent data on a weekly basis to track prospect activities and ensure your outbound timing is opportuned and informed directly by what your prospects are looking for, reading, and consuming. Contact identification - Using successive reporting filters with sales intelligence and social selling tools to mass-convert leads in your CRM database to create a highly targeted list of contacts, sorted by persona, business unit, and other important details. Email tracking and deployment - Using smart email automation to deploy finely-honed outbound emails in sensible cadences with full tracking of delivery, open rates, and engagement. Centralized automation - To enable all of the above. By having smart automation to incorporate triggers, buying signals, contact databases, and email tracking plus deployment into a single, automated workflow, you can go from manually sending out a handful of emails and hoping they hit home to building out a true account-based sales development campaign at scale. While combining these two pieces of the ABSD puzzle - the art and the science - definitely puts sales teams ahead of the curve in account-based sales development, there’s obviously more to the picture. There are other important strategic concerns, like delving deeper into the “how” and “why” certain accounts should be chosen as target accounts - what criteria should be used, and how to approach accounts of different size and use cases. There are also important technical and strategic concerns, such as data governance: The very significant challenge of keeping your sales data in order. How can you ensure your sales data is always available, usable, secure, and at the highest quality to maximize your ability to close deals? Are there organizational strategies you can use to ensure your sales data engine keeps cranking? I cover these exact topics with senior sales leaders Karan Singh and J. Ryan Williams in our interactive webinar on ABSD strategy, tactics, and tech. Thanks for reading. With over twenty-five years of sales and operations experience, Lars Nilsson is a global leader in enterprise software and selling solutions. He is currently the VP of Global Inside Sales for Cloudera, the company that has revolutionized enterprise data management by offering the first unified platform for data management and analytics. Lars and his team at Cloudera built the sales methodology Account-Based Sales Development (ABSD), which has transformed how businesses approach high-value targets. Lars also leads the Sales Enablement and Field Readiness teams at Cloudera. 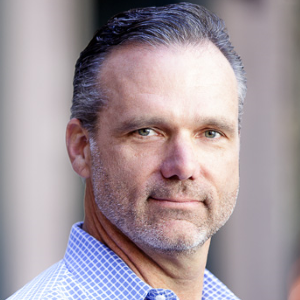 Prior to Cloudera, Lars founded SalesSource, a business services consulting firm specializing in CRM customization and sales process development to help venture-backed startups scale and drive pipeline. Lars has also served in sales executive roles at ArcSight/Hewlett Packard, Riverbed Technology and Portal Software. All four companies achieved IPO during his tenure.